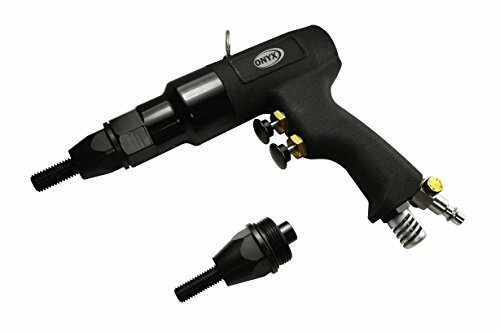 The Astro PRN12 ONYX Pneumatic Rivet Nut Setting Gun W/3/8" & 1/2" Mandrels allows the user to dial in regulator settings for specific rivet nut sizes and compositions. It includes forward and reverse actions for quick operation and has a free speed of 400RPM. This unit has an 1/2" rivet nut capacity and includes 3/8" and 1/2" mandrels. Specifications: Free Speed: 400RPM Capacity: 1/2" Air Inlet: 1/4" (6mm) Net Weight: 3.489lbs (1.58 kgs).